Soufly's eleventh album to date titled "Ritual", is the most and last album thus far, as the band see's themselves do nothing but tour for the time being. Main man Max Cavalera vocalist/lead guitarist of the band, got into a bit of a discussion of this album, touring activity, and how he manages to handle so many projects at once i.e. 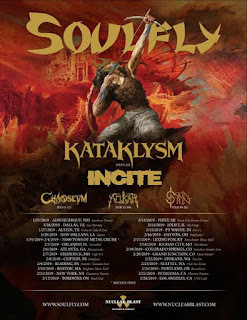 Soulfly, Cavalera Conspiracy, and Killer Be Killed. 1. Three years have passed since we last and first spoke in 2015, what has the band been up to? Max: Ummm lot’s of touring last year, we went around the world a little bit. Made a new record, came out last year called “Ritual”. New tour starting next week, hopefully we can go everywhere with it. The fans liking the album and reviews were great, some amazing as well. I am super excited to get back on the road. Our plan is to tour, no new music this year, just touring for now. Going everywhere, festivals, touring, do it all. I am very excited for this upcoming U.S. tour, should be really fun. Mixing the new material with the old material should make an interesting set list. 2. Your eleventh album "Ritual", has been out for sometime, but do you have any new music already in the works? Max: No, not right now. 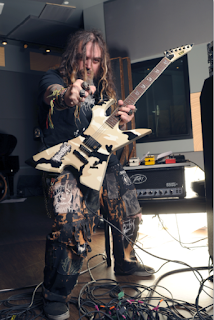 I just put out two records out, one after the other, Cavalera Conspiracy's and then Soulfly's. In the way it worked out, this year was left open for touring! We are all booked up from now into the summer time. Lots of festivals, and runs across various countries and another U.S. run. So this year is devoted to touring, this kind of music is all about the live show and performance. The places we play are perfect for it, special and lots of fun and a total blast every night. The set list will be changed from night to night as much as we can. I look forward to getting out and sharing this music with the fans. I still don’t get tired of it, even after 30 years of it. Very confident it will be a great tour! 3. Does it ever get tiring having to juggle so many bands? Max: I get overwhelmed sometimes. I remember when I was done working on material for the last Cavalera Conspiracy album, my manager had told me it was time to write material for a new Soulfly album. I was like "no, stop no. I am empty right now, I have no ideas." Little by little new ideas came along, and it came out great. The team behind it were all great. It was so much fun, the hardest part would be diving the material, with what goes to what. This being better for this or that band, I like the challenge, and like that I have three ways to get material out there. Being more flexible and able to do so many things and playing so much material including my earlier works as well. One foot in the past and one foot in the future, you can enjoy both works. In my current state of career being, it's a real blessing, being able to play shows, revisiting certain albums, writing all new material, some people do one or the other, we can do both and it is really cool to do. 4. Have you ever written a new song and accidentally made said song for one band but had it meant for another band, getting the material mixed up, since being a part of so many bands. Max: A lot of times, I write for certain records. So it doesn't get all mixed up. 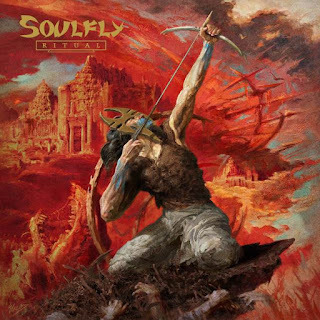 When it was time for this "Ritual" album, I was engulfed in the Soulfly world, listening to our earlier releases, recreating that magic of this band. The other thing is is my own love for metal music. The combination of groove, death metal, and thrash metal together is my universe. I am in the comfort zone in those genres with this music. Like the song "Feedback", is more of a rock n' roll song, it was fun and awesome. Sometimes trying different things, experimental, Soulfly adding in some saxophone it was cool. I've heard others come to me and say that song sounds cool. We are always trying new things and pushing the envelope a bit. Grow as a musician, it's a line between pleasing the fans and doing something you have not done before. We have done both and it is always fun. So much fun was put into this "Ritual" album and how everyone loved it, made me very happy that everyone likes it. Music is done for the fans and for us as well. It's an underground thing for us, a lot of the other music I have heard is underground music, me being supporting their world. This is still being a part of my life and being a side of my young life Max. It is still alive and enjoying metal music, something that is treasured very much. I am always discovering new bands, telling others about them it is all I love and the community as well is cool. 5. Since you have these three acts to juggle around, will we ever see them come together for a show and or tour? Max: All three that might be a little much. There would be extra Red Bull endorsement for that tour. I don’t know, I would like to do more, other projects to deep my toes into. Nothing official yet but hopefully one day type of thing. 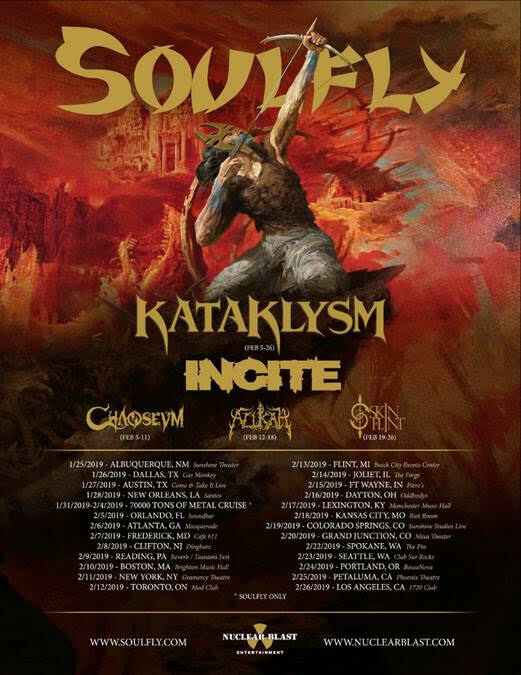 In that 70000TONS OF METAL cruise ship, I am playing Soulfly album one night, and then the other night playing “Return to Roots” material of my earlier works. So that’s dividing a little bit between them. But if it comes up, I would love too and it would be cool. Just have to have that energy to do it. 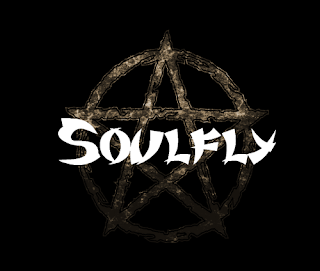 Right now, Soulfly’s shows run an hour and a half, if you put another hour or so 3 hours would be too much. We will leave that for future plans. 6. Once the tour in the USA is over what do you have planned afterwards? Max: Right now, just touring, going to as many places as we can. Got some festivals in the summer, hopefully another U.S. tour as well. I like these packages we have been doing, hopefully another U.S. tour we can do with some more bands. We have visited 80 countries already, we can visit more we have never been to before. It is fun and nice to have a complete touring year. Don’t think it has been this way before, always recording and writing. This year nothing set for recording and just enjoy and tour as much as we can, bringing the metal to the masses! Winx Club Returns with Season 8 Trailer! Rozu Talks of New Music and Upcoming Plans! Filmspeed Releases New Video for "Bless My Soul"
Fake Figures Releases Video for "Hole in the Sky"
Filmspeed Talk About Touring and Music! CAELESTIA RELEASES NEW VIDEO FOR "THANATOPSIS"
Vistery Releases New Album "Death Is Dead"
Belle Morte Releases New EP "Game On"